Group presentations can be arranged for any number of participants, focusing on any aspect of the game, and for any length of time -- at your location or one of my locations. Since each situation is unique golf instruction clinics are scheduled and priced on an individual basis. 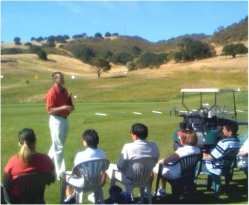 Clinics, seminars, workshops or large group lessons can consist of mostly lecture and demonstration on any area of the game, or the focus can be more hands-on -- working with all participants on their techniques. I hold pre-scheduled clinics on various aspects of the game a few times a year. See below for upcoming clinics. Please fill-in and send the form below to reserve your spot in the clinic. I will get back to you by e-mail (usually within 24 hours -- or after a weekend). I do not require pre-payment for the clinics or classes, but since I am limiting the number of participants please be sure you can attend before reserving a spot, and check your email (and your junk/spam folder) and be sure to reply to confirm that you received my emails and to reconfirm that you will be there. Thanks.